In order to celebrate School Library Month I was asked by MyVoucherCodes to write an opinion piece about e-books and their role in reading. I thought this would be a great opportunity for me to throw in my two cents about e-readers versus good, old-fashioned, paper books. I recently posted an article on my Facebook page about the use of e-readers versus paper books and it was one of the most viewed and commented on articles that I have posted. Readers are very passionate, it seems, about being able to obtain paper versions of their favorite books. I have to admit that I am definitely a book hoarder and that an entire room in my house is dedicated to my books. I have had a collection of books going back as far as high school. When I moved to a new city to attend graduate school in my early twenties, my car was filled with mostly books and very few other essentials. And when my family and I were house hunting several years back, we opted for the four bedroom so that one room could be devoted to our precious books. I have amassed quite a collection of paper books of which I am very proud. Although these books would have little value to anyone else, I love the fact that I have many Latin and Greek books that are out of publication. I also have the rather worn copies of some of my favorite classics like Pride and Prejudice and Jane Eyre that I first read when I was in high school. I also love walking by my shelves and perusing the various collections of books I have gathered, such as my ever-expanding New York Review of Books selections, my growing collection of Persephone Books and my new collection of signed Indie author books. But I also own an e-reader for many reasons, the most important of which is the offering of books in the ever-expanding world of self-publishing. I currently have over 300 books on my Kindle, many of which are books from self-published authors. My favorite author actually publishes his books on Amazon first as a Kindle edition only and if I didn’t have an e-reader then I would still be waiting to read his latest book. This reason alone is worth it to me to own an e-reader. And as much as I love my room full of books, it does cut down in a small way on the number of paper books in my house. In addition, many publishers offer galley or early copies of new books to book bloggers as electronic copies only through sites like NetGalley and Edelweiss. So if one is a blogger and wants to accept galley copies of books then an e-reader, particularly a Kindle, is a necessity. This year the school at which I teach has given all of the students I-pads. The I-pads also come with reading apps such as the Kindle app and I definitely see the convenience of such apps in my students’ lives. In general students can have access at their fingertips to literally hundreds of books that they don’t have to carry around. In my opinion, getting students to read and even getting them excited about reading is much easier when they have easy access to a variety of choices. With that said, the most popular place on our campus to study and hang out is still the school library and in all of my classes I still see kids carrying around their favorite old-fashioned paper books. I would love to hear my readers’ opinions on this topic. I am sure you all have passionate feelings about the use of books versus e-readers, so leave me your comments below! 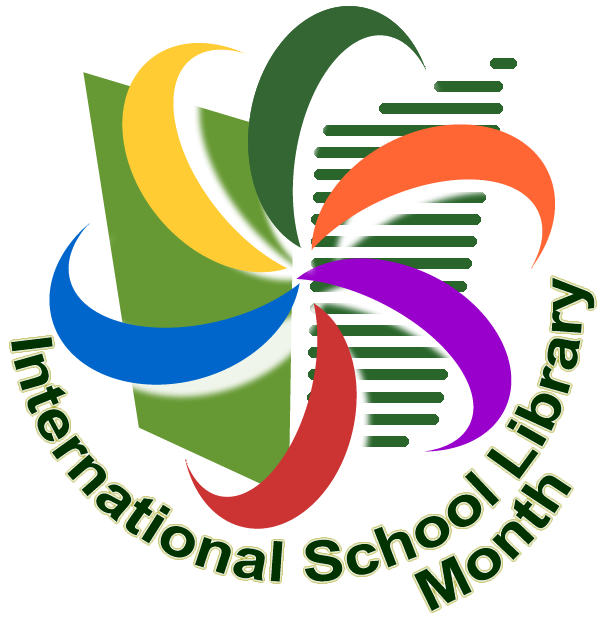 And don’t forget to celebrate School Library Month by visiting and supporting your local library. Love both! Ebooks are (sometimes) a better deal, and my poor, tired eyes appreciate the option of enlarging font size. But I treasure my print books, especially those that are signed. That’s a great point about e-books, Martha! I like the bigger font options too, especially when I am reading in the evenings! I’m sure e-readers are more convenient but there is something in the experience of holding a book in your hands and reading it that I wouldn’t want to give up. In all my years of cleaning out closets, the only thing I’ve regretted giving away was a book. It was something about Chinese emperors. As soon as I get rid of a skirt or blouse, I forget I ever had it. I like paper books for non-fiction, especially how-to books or books about health. I underline and leave notes in the margins. I can do something similar with my Kindle, but it’s not the same. I do like my Kindle. It’s small; I can decide I want to read a book, and a few minutes later, I can start reading; it doesn’t take up space in my house; and the book are usually cheaper. My next purchase, though, will be a soft-cover book from the independent bookstore in town. I don’t want it to go out of business. I like your point about getting young people to read. So important. I’m still wedded to paper but not because of any particular prejudice against ereaders. I prefer reading from a page rather than a screen. That said, I miss spying on fellow passengers to see what they’re reading and would hate not to be able to nosily look through friends’ bookshelves when visiting. And, of course, ‘books to furnish a room’ – all those gorgeous colourful spines. I’m pretty firm in my love of paperback books–I like them for many reasons, but I must admit that one my recent 2-week trip to Italy in which I only took a carryon roller bag, my Ipad Kindle app was a lifesaver. I have to read daily–sort of like breathing–but I couldn’t afford the weight and bulk of my beloved paperbacks. I definitely see the value of Ipads with e-reader apps for school kids–having a book always there could make the difference between a reader and a non-reader. I enjoy both. I lean towards ebooks due to cost, portability (especially when traveling). I don’t have the space for a ton of books, also lugging books around isn’t fun (costly to move). I also like enlarging the font. I never thought I would take to an ereader, I was wrong. Both have pros/cons. No doubt if I was in my forever home with room to accomadate a plush library I’d gravitate towards books. There’s nothing like a cherished leather bound first edition – the smell, the feel, the thrill of turning pages, the provenance, miss this experience with digital copiee. Great post Melissa.